Tag Archives for " Jaime Tardy "
In a recent post, I wrote about the idea of making choices about how you optimize your business and then using that focused choice as a tool for making daily decisions. 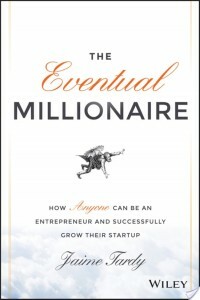 My guest for this week’s episode of the Duct Tape Marketing Podcast is Jaime Tardy, founder of The Eventual Millionaire and author of The Eventual Millionaire:How Anyone Can Be an Entrepreneur and Successfully Grow Their Startup. We talk about growth, building a business, and how to be happy doing what you love. Tardy’s take on how she built her business while keeping a keen eye on how this shaped her lifestyle is a great example of someone who is extremely focused on what she wants and doesn’t let the distractions get in the way because she has such a simple, yet clear, picture. In this interview, she shares a few of the biggest tips she has learned and more importantly applied as a result of conducting hundreds of interviews with millionaire business owners. From where did you get the name The Eventual Millionaire? What is your approach to mentorship? What are some common traits of successful business owners? This week’s episode of the Duct Tape Marketing Podcast is brought to you by Freshbooks – Small business accounting software in the cloud. FreshBooks is offering a month of unrestricted use to all Duct Tape Marketing listeners – totally free right now…. and you don’t need a credit card for the trial. – Signup for your free trial!